The software security field is an emergent property of a software system that a software development company can’t overlook. The concept demonstrates how developers, architects and computer scientists have started to build systematically secured software. In a nutshell, software security is the process of designing, building and testing software for security where the software identifies and expunges problems in itself. Basically, the idea of software security involves a proactive approach, taking place within the pre-deployment phase. The best practices leverage in building easier-to-defend code. It’s more about to help builders do a better job so that operators end up with an easier job. 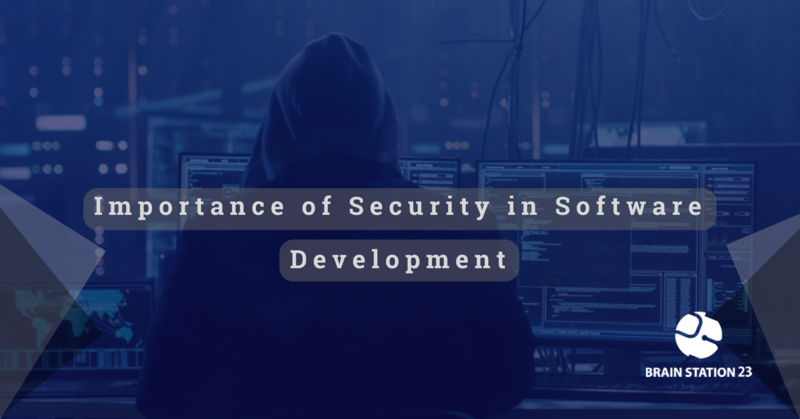 But unfortunately, many software development companies are not aware of the importance of security best practices following the absence of knowledge of how they can best architect and develop software based on core security principles. It’s necessary to understand the importance of building a secure software than regret later. Why is software security important? In today’s’ business processes, a simple error can end up resulting in millions of dollars of loses. Not even big enterprises are free of risks. The most common malicious attack like SQL injections, command injections, buffer overrun, stack buffer overflow attacks can harm the reputation of any well-known company as the damage is remarkably huge. So, all of these companies are big, well-known firms, and they would never let themselves open to attack. Well, they were. Now think, what happens to other companies with fewer resources which need to enforce security? Can they sum up the loss if anything happens like this? That’s why software security is important to build from the scratch of the development phase, as prevention is better than cure. At the beginning of the design and architecture level, a software must be consistent and present a unified security architecture that takes into account security principles. Designers, architects, and analysts need to acutely document assumptions and identify possible attacks. Risk analysis is a must for each and every phase of a software development lifecycle. And most importantly, after handing over the software, maintenance and updating the software time to time is a must to protect the software from any new kind of malicious attack. At Brain Station, the focus is to build a flawless system that takes security best practices into consideration in every level of design, development and implementation. While a system may always have implantation defects or “bugs,” have found that the security of many systems is breached due to design flaws or “flaws”. Brain Station believes that if it can design a secure system, which avoids such flaws, we can significantly reduce the number and impact of security breaches. While bugs and flaws are both different types of defects, company believes there has been quite a bit more focus on common bug types than there has been on secure design and the avoidance of flaws. Authentication Mechanism & Authorization: This process includes a securely designed system that prevents the user from changing identity without re-authentication, multi-factored authentication, security control mechanism, resource permissions, file and database permission etc. Brain Station ensures these issues with such expertise that protects any software from authentication related concerns. Data validation: In the development life cycle, Brain Station always focus on the data validation process which comprises centralized validation mechanisms, transform data into a canonical form, use common libraries of validation primitives, implementation of language level types to capture assumptions about data validity etc. Cryptography: Cryptography is one of the most important tools for building secure systems. Through the proper use of cryptography Brain Station ensures the confidentiality of data, protect data from unauthorized modification, and authenticate the source of data. Cryptography can also enable many other security goals as well. Identifying & Handling Sensitive Data: One of the most important tasks that the designers of Brain Station do is to identify sensitive data and determine how to protect it appropriately. Data sensibility depends on many factors including regulation, company policy, construction obligation and users’ expectation etc. Technical data sensitivity includes access control mechanisms (including file protection mechanisms, memory protection mechanisms, and database protection mechanisms), cryptography to preserve data confidentiality or integrity, and redundancy and backups to preserve data availability etc. Analysing Security Impact of External Component Integration: While integrating any 3rd party applications in any software, there is a considerable risk to invite certain threats that comes along with the 3rd party integrations. Brain Station analysis the chances of 3rd party application errors that could be disguised as software errors, access issues between third-party applications and the particular software, incompatibility of the third-party application and the software interface etc ensuring that any external integrations work as expected and do not affect the existing functionalities of a software. Audit Log: This process records security-relevant chronological events which are very important for security and process improvement reasons. Brain Station ensures the compliance programs for industry specific needs such as CSA for Cloud Security Alliance Controls, PCI for payment card standards, FIPS for Government Security Standards, FISMA for Federal Information Security Management, HIPAA for Protected Health Information etc. Back-up & Recovery: Brain Station provides synchronized replication of data wherever applicable. Point-in-time-recovery (PITR) & Nightly backup solution is also available in case of reverting the application to the desired state if needed. Brain Station regards their customers ensuring the very best quality services ensuring security and privacy at every level of the software development cycle. The company is one of the top ISO 27001 (International Standard for Information Security Management System) and ISO 9001 (Quality Management System) certified countries of Bangladesh. It chooses the best resources to ensure the best quality products. As Brain Station establishes an evolutionary path of increasingly organized and systematically more mature processes of secured software development, they are enriched with resources like CEH (Certified Ethical Hacker) , CHFI – (Computer Hacking Forensic Investigator) etc so they can find out security loopholes & let authority know about the issues to solve the glitch. Lets see some industry specific areas where Brain Station applied the best security practices. Banking application requires a highly secured domain to protect the confidential information of their clients. Brain Station provide application security audit for bank industries and develop such applications those are hard to decrypt, secured from the scratch level of the code, tested in every phase of the software development life cycle so that the application can protect itself from any common type of vulnerability. Brain Station provide e-commerce application audit which includes application structure, platform analysis, coding convention and security aspect, SEO audit etc ensuring by the skilled e-commerce audit professionals that covers all expected threats or malicious attacks like cross-site scripting, SQL injection, bad bot targeting etc. The company also carefully handles the most common issues of e-commerce sites like server outrage, data lost- which may cause a virtual loss of visitors and can harm the reputation of any site. News portals demand the highest security to preserve the sensitive information from the hackers and other vulnerabilities. Brain Station maintained the standard of their service by ensuring the technical audit report on the main site, technical audit report on database, SEO audit etc. Regular data backup, nightly backup, integrity maintenance etc are also available in case of any emergency or data loss. To know more about your chances for excellence in software security or simply top quality and best cost position software development at Brain Station, click here or on Contact.